Grammy Award-winning singers Ashanti and rapper Nelly split up in 2012 after spending nearly a decade together. Not much has been said on what caused the split, but Ashanti may have dropped a few hints when she was a guest on The Meredith Vieira Show on Friday. The 34-year-old Foolish singer explained that things ended with Nelly, 40, because of issues of trust. Ashanti is at the tail end of a legal battle with a stalker. She opens up about the experience, and how she has reclaimed her sense of security. “The Following” star Michael Ealy reveals he had an awkward phase and talks about what it was like working with Mariah Carey! 'I think sometimes when people have their own insecurities it allows them to act out of character. I've been betrayed,' Ashanti described. 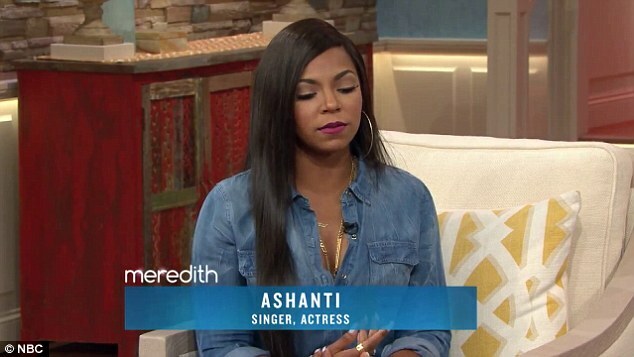 Ashanti also touched upon a stalking situation she'd had to deal with. 'We were talking in the beginning of the show all you've been going through with this man, this stalker,' Meredith said. She continued: 'At this point you don't know how far someone will go. I have a mouth on me, if I say something a little crazy I don't know what's going to happen after that so just be strong and keep your composure.